A live band playing a wide variety of chart hits for you to dance the night away, from the 60s through to the present day. In addition we also offer specialised 70s nights, dinner jazz music and a James Bond 007 set. So please feel free to browse through this site using the green navigation menu on the left of your screen: we look forward to hearing from you. Up Side Dawn typically play two sets per gig, lasting approximately one hour each. The music performed is a mixture of hits from the 60s right through to the present day and our main aim is to ensure everybody has a great time boogying on down on the dance floor to some funky tunes! In between sets we are more than happy to play pre-recorded music through the PA system so everyone can keep on dancing, and the PA is always available to use for announcements and speeches. Up Side Dawn also offer additional theme sets if required. We have enough music in our repertoire to be able to play just 70s tunes for either one or both of our two sets, and if desired we can dress up in appropriate costumes for a 70s disco night. Also available is a James Bond set comprising 12 well known 007 soundtrack themes, and a sophisticated jazz set, each lasting one hour. Either of these last two options may well be suitable earlier on in an evening; both are ideal for a reception or to enhance the atmosphere during a meal. 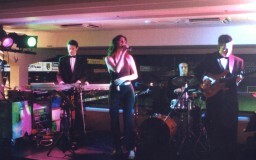 Up Side Dawn normally play a selection of hits from our set list at a gig, but it is possible to play special requests made in advance, for example, a particular song for a first dance at a wedding, or a specific strict tempo dance. Please do not hesitate to contact us for further details. Please note: Not all of the following songs are performed at every gig. Please note: Not all the above songs are performed at every gig. Please note: On occasion, due only to extenuating circumstances, the band personnel may vary. The primary aim of Up Side Dawn Party Band is to provide exceptional musical entertainment at every engagement we attend. Whether it be a wedding, corporate event or a university ball, we will ensure that it will be a day and night to remember.